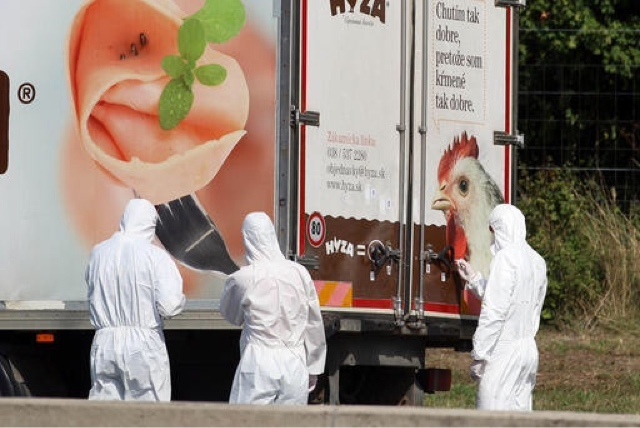 Investigators stand near a truck that stands on the shoulder of the highway A4 near Parndorf south of Vienna, Austria on Aug. 27, 2015. Photo by Ronald Zak. An abandoned truck “full of bodies” (apparently the count is 71) was found on the side of a highway in eastern Austria, near Parndorf, on Thursday. Police said the dead were thought to be refugees. This happened in the Austrian state of Burgenland. Now we hear the number 71. The Krone newspaper reported that initial indications were that they suffocated. The truck had been purchased from a company that did not remove their branding from the vehicle. They told the media they would not be doing that again. So, this truck was found a short distance from Parndorf. Parndorf literally contains the common German root "dorf" for "town/city" and a simple word, "parn," which hides a complex meaning and other links. In Old German, "parn" refers to the "grass of Parnassus." Mount Parnassus (/pɑrˈnæsəs/; Greek: Παρνασσός, Parnassos), is a mountain of limestone in central Greece that towers above Delphi, north of the Gulf of Corinth, and offers scenic views of the surrounding olive groves and countryside. According to Greek mythology, this mountain was sacred to Dionysus and the Dionysian mysteries; it was also sacred to Apollo and the Corycian nymphs, and it was the home of the Muses. The mountain was also favored by the Dorians. There is a theory that Parna- derived from the same root as the word in Luwian meaning House. The name "Parnassus" in literature typically refers to its distinction as the home of poetry, literature and, by extension, learning. The Montparnasse area in Paris, France, for example, bears its name from the many literature students who recited poetry in the streets, who as a result nicknamed it "(le) Mont Parnasse". This then links to a significant synchromystic movie. The Imaginarium of Doctor Parnassus is a 2009 fantasy film directed by Terry Gilliam and written by Gilliam and Charles McKeown. The film follows a travelling theatre troupe whose leader, having made a bet with the Devil, takes audience members through a magical mirror to explore their imaginations and present them with a choice between self-fulfilling enlightenment or gratifying ignorance. Heath Ledger, Christopher Plummer, Andrew Garfield, Lily Cole, Verne Troyer, and Tom Waits star in the film, though Ledger's death one-third of the way through filming caused production to be temporarily suspended. Ledger's role was recast with Johnny Depp, Jude Law, and Colin Farrell portraying transformations of Ledger's character as he travels through a dream world. Several starting points in the plot line of the film's story link to material I've written about in my Twilight Language blog of late, including Mr. Nick/Devil/Nicholas, bridges over water/Bridgewater, and, of course, Heath Ledger's presence in The Dark Knight Rises. To wit, Doctor Parnassus' (Plummer) theatre troupe, which includes sleight of hand expert Anton (Garfield), confidant Percy (Troyer), and Parnassus' daughter Valentina (Cole), performs outside a London pub. A drunk (Richard Riddell) barges onstage and crashes through a stage mirror, where his face changes (Bruce Crawford), and he enters a journey of imagination that culminates in a choice between a torturous-looking twelve-step program and going to a pub. He enters the pub, but it explodes; in the real world, Parnassus says he has lost another one to Mr. Nick (Waits). Mr. Nick reminds Parnassus that in three days Valentina turns 16, and her soul will be his. Drinking and playing tarot, Parnassus tells Valentina that, centuries earlier, he ran a monastery where monks perpetually recited stories to sustain the world. Mr. Nick challenged their beliefs by sealing their mouths. The world survived, but Parnassus claimed it was because of stories told elsewhere. Mr. Nick had bet Parnassus who could win more souls. Parnassus won twelve souls before Mr. Nick, and gained immortality. As the troupe crosses a bridge, Anton spies someone hanging beneath it. They rescue the man (Ledger), who spits out a golden pipe when revived. Claiming to have amnesia, the man joins the troupe as a barker. Parnassus becomes despondent over the impending loss of his daughter. Mr. Nick visits Parnassus, revealing the hanging man is a disgraced philanthropist named "Tony". He offers Parnassus a wager: Valentina can stay with whoever wins five souls first. It continues on. It is a genius story. Director Terry Gilliam and screenwriter Charles McKeown wrote the script for The Imaginarium of Doctor Parnassus (2009), their first collaboration since The Adventures of Baron Munchausen (1988). The labeling on the truck was unfortunate as these people were merely a form of human cargo for someone trying to make money. The metaphor is the message from Parndorf.